In Master Your Story we help you find that passion. We introduce you to people who are living their passion. In this week’s episode we speak with Andy Montero, Guru of the Tiki World, as he is so affectionately known. Andy is the Creator at A. Panda’s Tiki Lounge and Sr. Business Development Manager at Constellation Energy Group. Andy has taken his passion and created a life of excitement, beautiful friends, and of course a loving family. What’s Andy’s passion? Tiki and everything related to that culture. In this Internet world anything is possible. When you step inside any of this nation’s great Tiki bars, you’re not merely walking on bamboo — you’re entering a world of escapism, where you can almost feel the ocean breeze through your (probably mostly unbuttoned) Hawaiian shirt. But sometimes, those arrays of Tiki masks can be a bit dizzying, so we asked Andy to help us grasp his passion and take a step back and examine the Tiki trend. How did it come to be? What are those little umbrellas for? There are so many questions. Andy connects with like-minded people from all over the world and they share a culture. Want to know a cool place to have a Polynesian experience?, connect with Andy. From Ft. Lauderdale FL to Hawaii the Tiki revival is alive. 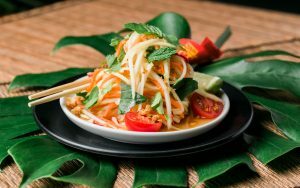 Even in Illinois you can find “Three Dots and a Dash” Chicago’s premier tropical tiki bar and craft cocktail destination hidden below the bustling streets of River North. The secret hideaway – named one of The World’s 50 Best Bars by Drinks International – is led by cocktail expert Kevin Beary. Surrender all your cares and let Three Dots and a Dash whisk you away onto a tiki tropical excursion. So what’s it all about… passion. Passion for a culture that needed an infusion of americana to revitalize it. Andy shares how his passion has brought people together. 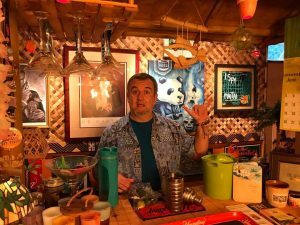 In this podcast you can learn about Jeff Beach Bumb Barry, authority on Tiki beverages and all the artists, musicians, mixologists, wooden carvers and all the creative individuals that make up Andy’s Tiki Ohana (family). Like what you hear? Want to Stay connected to Master Your Story for upcoming webinars, coaching sessions and more? Sign up here on the website to become part of our tribe.